You are here: Home / Money / Business / Despite The Media, Donald Trump is Winning for We the People. Despite The Media, Donald Trump is Winning for We the People. (ThyBlackMan.com) I love the old gospel song, “Peace In the Midst of the Storm.” https://bit.ly/2G26szy In the midst of the Deep State’s raging, unprecedented hate-storm against Trump, he remarkably remains at peace, and so should we. 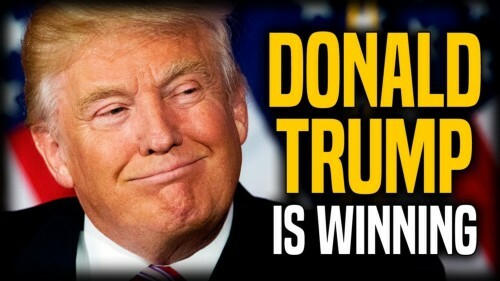 Trump and We the People are winning. Fake news media sells its lie 24/7 that voters regret voting for Trump and he is mere days from impeachment. In truth, Donald Trump’s approval has risen to 51%. https://nws.mx/2KEiTVRLeftists are pulling their hair out in frustration; screaming, how can we stop this freaking outsider amateur politician? The tide is turning in our favor. Pop icon Kanye West’s recent conservative comments and praise for Donald Trump is huge. With Kanye’s 27 million twitter followers, millions of blacks heard conservatism for the first time. Since Kanye’s conservative tweet, black male approval of Trump has doubled. https://bit.ly/2JOUonu In essence, Kanye’s message mirrors mine; stop weakening yourselves with victim mindsets, make right choices and simply go for your dreams. Liberate yourselves from slavery on Democrats’ government dependency plantation. In Trump and Kanye, God is using unexpected vessels to spread His truth. Conservatism truly is best for all people. Kanye represents a huge crack in leftists’ wall of ignorance enslaving low-info voters. Amazingly, Donald Trump’s Secretary of State Mike Pompeo is headed home from North Korea with 3 previously held hostages; a gesture of good faith for Trump’s meeting with Kim Jong Un. https://bit.ly/2K7CA7m Can you say “Trump: The Art of the Deal” boys and girls? If Trump successfully ends the 70 year Korean war and Kim Jong Un follows through with his vow to end North Korea’s nuclear program, Donald Trump absolutely deserves the Nobel Prize. If Trump wins the prize, that giant popping sound will be leftists’ heads exploding around the world. Extraordinary great things are happening folks. Americans suffering with high taxes, low wages and high unemployment was Obama’s proud new normal. Trump has dynamited Obama’s mountain of overreaching tyrannical job-killing regulations; reversing over 800.https://bit.ly/2Is3Ccg Trump has unemployment at 3.9%, the lowest since 2000. https://bit.ly/2jGR17b In his first year, Trump created 2 million jobs. https://bit.ly/2m4jwNy His tax cuts has our economy booming; creating more jobs and Americans smiling again with more money in their pockets. https://bit.ly/2HLDyWfManufacturing jobs have risen to 304,000 under Trump. Black and Hispanic unemployment is at a historic low.https://washex.am/2rkgpDW All Americans are winning with Trump in the White House.